Detention‘s scariest ghost stories aren’t just in your head. Allegorical fear has become a tradition for survival horror. In games like Silent Hill or Neverending Nightmares, characters must not only escape a nightmare world of industrial soundscapes and claustrophobic hallways, but also make some sense of their latent trauma and repressed guilt. Terrifying creatures and landscapes serve as figurative antagonists that block access to the horrors that exist in the everyday, such as domestic violence, self-harm, or child abuse. Fighting monsters serves as a way to indirectly confront these more difficult, underlying traumas that must be overcome to return to a normal life. 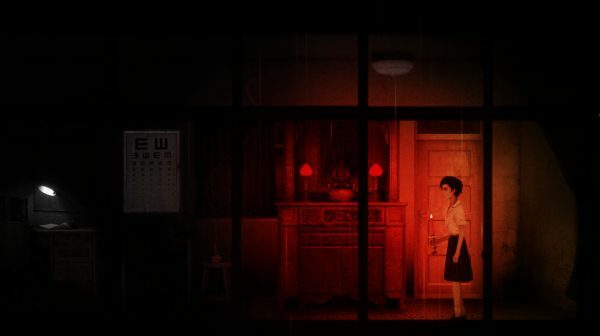 Taiwanese game developer Red Candle Games deploys trauma as a central theme in their side-scrolling, point-and-click survival horror game Detention, adopting real-world, historical subject matters that render its horrors all the more fraught. Released thirty years after the end of Taiwan’s White Terror, players follow the story of high school students Wei and Ray amidst this period of tyrannical martial law that took the lives of thousands of innocent people. 1960s political turbulence is refigured with the iconography of horror, suggesting that this historical period lies beyond the comprehension of a teenage perspective and thus can only be conceived as horrific and otherworldly as a result. When a government as shadowy and unknowable as that of Taiwan during this period leaves holes in public knowledge, horror fills in the gaps, and the White Terror itself becomes the allegorical monster with which these characters reckon. The White Terror refers to a thirty-eight-year period in Taiwanese history from 1949 to 1987, in which martial law precipitated the violent suppression of intellectuals, political dissidents, journalists, and many other innocent civilians, all under the guise of anti-communism. The February 28 Incident preceded the White Terror, resulting in over ten thousand civilians massacred during open rebellions following a clash between bystanders and armed government officials. Anti-government sentiment led to the establishment of martial law by the Chinese nationalist Kuomintang (KMT) government and its leader Chiang Kai-shek in an attempt to quell violence, but this period of White Terror culminated in the imprisonment, execution, and disappearance of hundreds of thousands of people. Detention’s coming-of-age story is interwoven with this traumatic history. As the high school girl Ray, players stumble upon the ways in which the White Terror infiltrated the everyday lives of students and the power hierarchy of the game’s emptied school setting. A number of school staff members have nationalist military backgrounds, such as the veteran Colonel Kao who serves as a maintenance worker, or Instructor Bai, a military officer who, according to Ray’s narration, lords over students like a despot. Ray muses that Bai was a “relentless killer during the war,” and he harasses students he suspects may be colluding with communists. Early in the game, the protagonist ruminates over the recent disappearance of Ms. Yin, a teacher confronted by Bai regarding a censored book list. Ray later finds a discarded note that reveals Yin’s involvement in forming a secret book club for select students to read prohibited books, and the reveal of this secret suggests the exposure of the club and the potential capture of Ms. Yin. The protagonist is left alone to wander the nightmarish school grounds which have been repopulated with “the lingered,” ghosts that stalk the halls for prey. 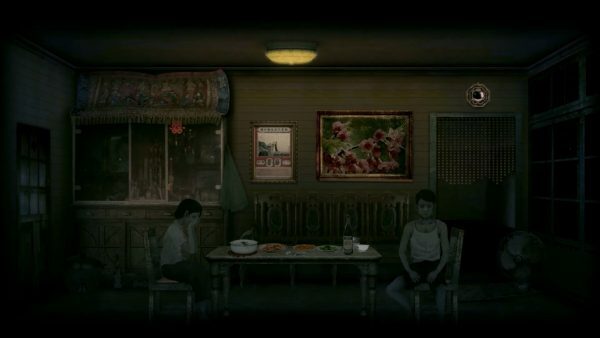 Nightmare versions of the world devoid of people are a trope of survival horror, but Detention contextualizes this soullessness with the disappeared peoples of the White Terror. The vanishing of other humans calls to mind this history, and these lingered dead evoke the countless victims throughout these decades. Martial law is threaded through everything in the game, like the school, ostensibly a place of learning and growing up, which here is grotesquely distorted into a prison guarded by supernatural entities. These stalking monsters find parallel with the school staff, as Ray discovers the principal to have been closely monitoring the students and keeping documents locked in filing cabinets. Even the name of the game, “Detention,” recalls a power hierarchy not solely restricted to a school, but also detention centers for political subversives. Indeed, the game acknowledges this context upon entrance to the Red House, a neighboring building that Ray remarks was once used by the Japanese as barracks during occupation. Ray’s encounter with chained prisoners in this location prompts her to ask, “What kind of criminals do they lock up here? Who are these supposed to be?” These rhetorical questions function as though the game itself were breaking the fourth wall and asking the player, coaxing them to reflect on the imprisonment of innocent civilians during the White Terror. Likewise, a classroom hosts a film projection of political propaganda, but the images horrifically distort. An adjacent blackboard displays the slogan, “Patriotism demands of us sustained sacrifice,” juxtaposing the film images of ghostly faces either wailing out in unimaginable pain or sneering at those words in cynical laughter. Ray fears surveillance and remarks upon her discomfort at being watched, but ultimately she must settle her guilt over her own cooperation with the state. As the game progresses, it’s slowly revealed that Ray ratted out the aforementioned book club to Bai, resulting in the death sentence of school counselor Chang, the imprisonment of her classmate Wei, and the disappearance of Ms. Yin. 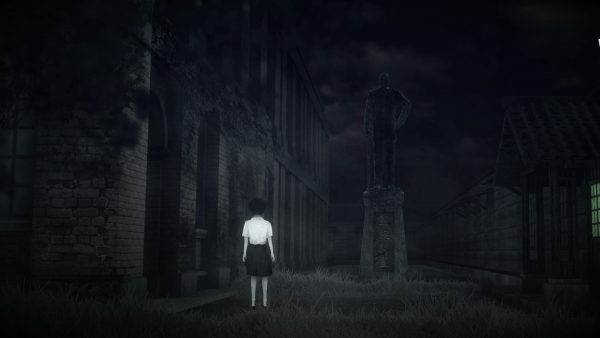 Ray’s purgatorial journey through the nightmare version of the school thus represents an externalization of her guilt. For instance, she encounters a marionette play that stages a mock execution of Wei, his upside down puppet mirroring an earlier scene in which Ray awakens to find his corpse in a similar position. A surrogate puppet is dressed in her clothing, suggesting a projection of trauma onto inanimate objects because Ray cannot address her difficult history directly. Instead, re-staging it allows her to work through it obliquely; she needs to confront her complicity because she’s repressed it altogether. By the last act, the monsters and evil spirits are no longer present, and Detention shifts focus to this sadder story of a downward spiraling family drama. In one notable scene, a variation in character movement literally reflects this change of pace. Ray initially jogs through a hallway lined with barbed wire and jail bars, but upon unlocking a door that allows her to slip behind this barrier, her stride slows to a walk. Ray marches slowly behind these bars, as though enacting the role of a prisoner or someone hesitant to face some trauma awaiting them. Traumatic imagery visually reminds both players and Ray of her treachery, such as a brief scene in her bedroom in which a school blouse hung upside down recalls the overturned torso of Wei. A final act fever dream of giant floating fish, garbled Technicolor landscapes, and disintegrating shadow worlds convey Ray’s collapsing mentality when domestic normalcy is upturned by an oppressive government. This guilt over the disbandment of the book club and the subsequent ruination of numerous lives haunts Ray like a ghost, and this betrayal is ultimately the true horror of the game. While Ray is responsible for the arrest and execution of members of her school’s book club, the game crucially avoids simplistic moralizing given the more complex history of Taiwan. As Noa points out in her excellent video essay for Critique Quest, Detention treats the main character and various subplots with a sympathetic eye. Ray is never vilified even though she cost the lives of innocent people, nor is Wei ever lionized as the true hero pitted against her. Instead, these students are just everyday people who were all victims of a tyrannical military state, thus creating what Noa calls a more “honest” experience. Two endings exist for the game, one of which is a “bad” ending that finds Ray unredeemed, concluding with her walking past a river of blood to receive a medal—revealed to be a noose in the game’s inventory—for her actions. The other ending, the true one, extends the game another ten minutes with Ray’s eventual redemption. The narrative jumps ahead many decades, finding Wei, now an old man, revisiting the school long after the end of martial law. Plant life has overrun these structures, and surfaces are vandalized beyond all recognition. In contrast to the rest of the game, it’s now a brighter summer day. The world has since moved on from the White Terror, and while its violence is still remembered, it belongs in the past. Wei returns to the school and seats himself in his old classroom across from an empty chair. The ghostly trace of the young Ray reappears, lingering but now forgiven, bygone but forever remembered with newfound warmth.